5. The figure above shows the graph of f', the derivative of a twice-differentiable function f, on the interval [-3,4]. The graph of f' has horizontal tangents at x = -1, x = 1, and x = 3. The areas of the regions bounded by the x-axis and the graph of f' on the intervals [-2,1] and [1,4] are 9 and 12, respectively. (a) Find all x-coordinates at which f has a relative maximum. Give a reason for your answer. 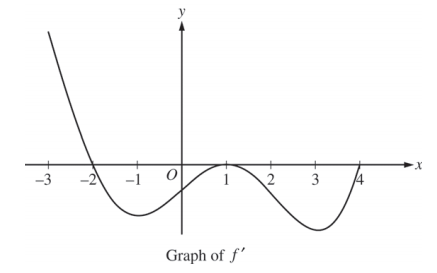 (b) On what open intervals contained in -3 < x < 4 is the graph of f both concave down and decreasing? (c) Find the x-coordinates of all points of inflection for the graph of f. Give a reason for your answer. (d) Given that f(1) = 3, write an expression for f(x) that involves an integral. Find f(4) and f(-2).